“From the Wild"'s Kevin Kossowan & Giselle Couteau from Edmonton’s beloved “Duchess Bake Shop” couldn't have picked a better week to visit us. 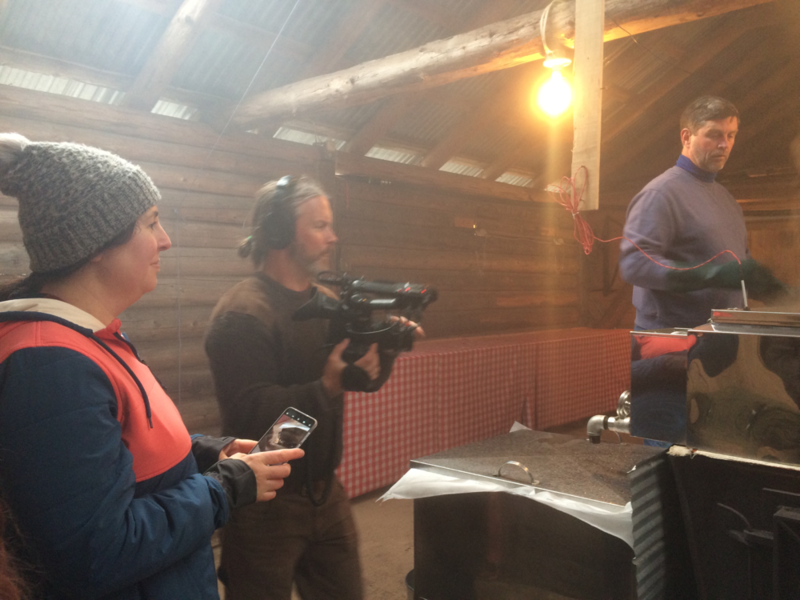 They were able to experience an absolutely gorgeous filming day in the woods Tuesday while we collected sap and then an awesome boil Wednesday with lots of sap, snow, heavy rain, wind, steam and syrup - virtually a whole sugar season expressed in one boil. It was our biggest production day this season, thanks to a sap sugar of close 3% and lots of it. As expected, given where we are in the season, both the colour and flavour profile shifted. Scott calls it late midseason syrup - excellent flavour with just a hint that the end of the season is coming. We’re going to boil today and clear the tanks before an expected minus 7 tonight and we’ll see what will happen over the next few days. Might get enough for a boil Saturday 😊.